Kim is a Dubai based female personal trainer & holistic coach focusing on providing a unique approach to living a healthy lifestyle. By combining Fitness, Nutrition, Life Coaching and Hypnotherapy she focuses on the Physical, Psychological and the Spiritual wellbeing of her Dubai clients. Kim motivates and encourages clients to obtain not only the physical goals they set but by changing their mind-set to make those goals a legacy. Kim provides support through personalised programmes for each client based on their goals and works with them to obtain those goals. 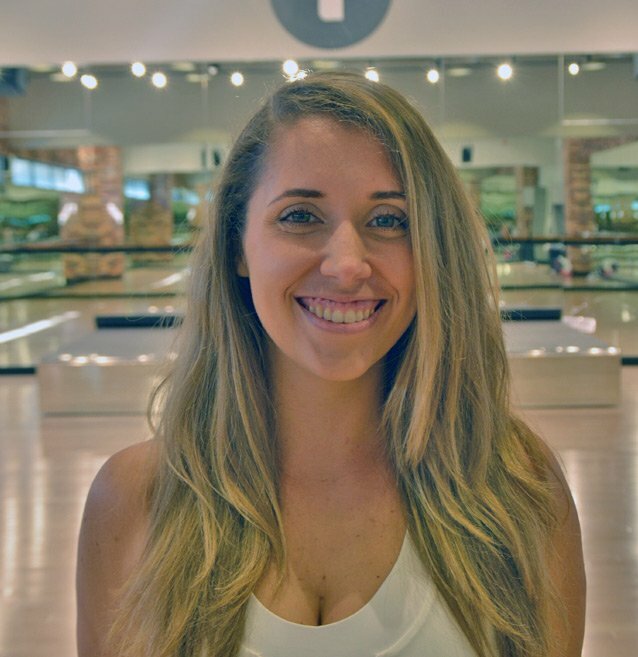 Dubai female personal trainer Kim has always had a passion for sports and fitness. She competitively swam during her childhood and teens while also playing a number of other sports. Her intrigue in nutrition came later when she dealt with her own weight lose battle, a number of health related issues and food intolerances. Kim’s move into the health and fitness industry was fuelled after years of working within a high stress environment in the UK. She found that her career and lifestyle were having an effect on her health. Kim decided that something needed to be done and found a harmonious balance through fitness, mindfulness and nutrition. This is when she discovered her passion was to help those who like her needed to step back and try to achieve that balance in their stressful day to day lives. As a personal trainer her main goal is to push you to be the best version of yourself that you can be. Through tailored exercise and nutrition programmes she can help you achieve your goals and in the process obtain a healthy balanced lifestyle. In Dubai every personal training client has different goals and needs when it comes to health, fitness and lifestyle changes. No one journey will be the same. Each client will be supported with a personalised exercise and nutrition programme specifically tailored to them to reach their goals and personal fitness needs. Body fat readings, tape measurements and photos will be used to track your progress from month to month and keep you motivated at the amazing achievements you are capable of. Kim’s mantra is give you the tools, education and motivation to create a happier and healthier lifestyle in the UAE which you can keep living long after you have achieved your goals. Kim specialises in weight management, body composition (muscle building) and pre & post natal exercise for ladies in Dubai. Kim uses a wide variety of methods in her training from HIIT, hyperthrophy, strong man, to a number of other methods depending on your goals. She likes to focus workouts on what is available in the environment around her but a few of her favourites are free weights, kettle bells, sleds and tires. She loves the leg press as well! Depending on your fitness goals Kim can provide personal training anywhere and everywhere. If you want to train outside of her base gym, Train SF Al Quoz, then please note that a small additional fee may be applicable for travel time. A full consultation will take please prior to you starting your personal training sessions in Dubai which will cover your goals, medical history, nutrition and starting measurements to track your month to month progress. Kim has an in depth process which she follows to ensure that you are getting the most from your sessions not only physically but that you are being supported throughout the process with nutrition, life coaching and anything else to get you achieving your set goals/dreams. Kim does have some equipment that can be uses in sessions outside of the gym however depending on your goals this will need to be reviewed. Kim is a nutrition and healthy eating expert so this is absolutely something she can provide. All nutrition, meal plan and supplementation protocols are tailored to each client individually because as you know it isn’t a one size fits all. Plans can be created to take into account your dislikes, allergies and any social occasions.This helps you incorporate better and healthier choices into your daily lifestyle habits. Depending on the area and number of people Kim can provide discounts.Pricing information and further details about group/family personal training in Dubai is available on request. Kim encourages you to book weekly training times which will be your time going forward. This will help you to start creating a habit out of your training. There is of course always flexibility as life does happen and things come up. Not a problem at all. Kim operates a 24hr cancellation policy so as long as you let her know this is fine. For current availability, personal training packages information and other questions please use the contact form below to get in touch with Kim.